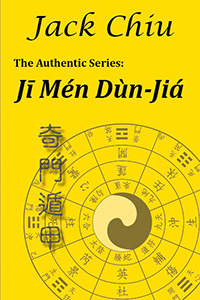 奇門遁甲 Jī Mén Dùn-Jiá (JMDJ in short) is one of 古三式 the Three Ancient Boards, which become the mainstream of divination techniques after 秦朝 the QÍN Dynasty (246BCE to 206BCE). However, the origin of JMDJ is legendary. It is said that the knowledge of JMDJ was passed down in a scroll titled 《陰符經》 the Scroll of Yīn-Fú by 九天玄女 the Maiden Warrior of the Northern High Sky. The version of 數理奇門 Rational JMDJ that we have today was revised by 張良 ZHĀNG Liáng, the first advisor of 漢朝 the HÀN Dynasty (206BCE to 226CE). In simple term, JMDJ is a rational art which integrates 六十甲子 the Sexagenary Cycle and 《洛書》 Luò-Shū for the purpose of divination. The former is related to calendar calculation, whereas the latter is a direct application of 後天八卦 the Acquired Bā-Guà. Describes what need to know in learning JMDJ including the concept of Yi, Wu-Xing, fundamental of Chinese calendar, as well as introduction to a typical JMDJ Board. Introducing the Rational JMDJ Settings, which includes the Yearly-based, Monthly-based, Daily-based and Double-Hourly-based JMDJ. Describes those settings that are typically considered auspicious and inauspicious by traditional JMDJ practitioners, and to certain extent, explains these scenarios in scientific manners. Introducing real life examples of JMDJ with an elevated view of deciphering. This book is written for people who were searching for an easy and rational way of learning JMDJ.